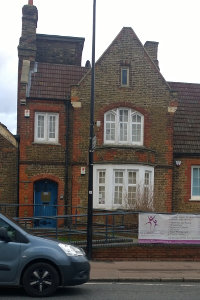 You and Me Counselling is a charitable organisation based in the London Borough of Havering, which was established in 2011. The charity came from the founder’s personal experiences, when she found there were no services out there to support her troubled teenaged son. Worried about his anti-social behaviour, she spoke to as many experts as possible, most of whom recommended CBT. After gaining a degree in CBT and experiencing the profound impact her journey had on her son, she wanted to help young people and their families in similar situations. Originally based in Romford, in October 2015 we moved to our new office in Hornchurch Town Centre. 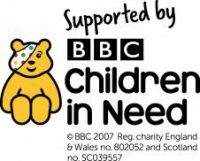 We provide vulnerable children/young people and their families with Information, Advice, Tutoring, Educating/ Role modelling, Mentoring, Counselling and Psychological therapies. We also work closely with children/young people and their families who display disruptive, anti-social and/or truancy behaviours in school and could be at risk of being excluded or have already been excluded from schools. Furthermore, we provide group therapy sessions, parental classes, and staff training sessions in schools. We are passionate about working with children and young people to establish an understanding of their situation and problems, hoping to instil/re-instil meaning and value into their lives. We also work with adult clients, providing support for a wide range of issues. For more information on the services we provide, please take a look at our services page. We have a large team of male and female counsellors and therapists, of all ages. We are comprised of different counselling orientations, including psychologist, person centred, cognitive behavioural therapy (CBT) integrative, spiritual and arts therapist. All of our therapists are members of the British Association of Counsellors and Psychotherapists (BACP), and work in accordance with the ethical framework. All therapists have an Enhanced DBS, and undergo regular training and supervision to ensure both personal and professional development. A recent report by the Centre for Mental Health ‘Missed Opportunities’, provides a body of evidence to support something You and Me Counselling has long recognised – that there is not enough awareness or adequate support for children and young people with mental health issues. In some cases there is a ten year gap between children experiencing their first symptoms, and when they finally receive help. Children with conduct disorder are 20 times more likely to end up in prison and four times more likely to be dependent on drugs. These problems are often even more extreme for children of substance-misusing parents as they often lack positive role models. 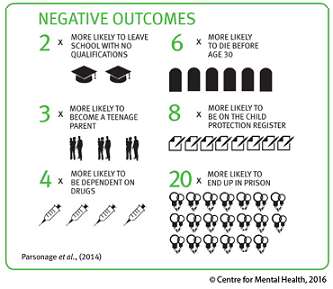 The ‘Missed Opportunities’ report states that: “Young people generally value support that is genuine, warm, confidential, non-patronising, that co-produces solutions and builds on strong relationships”. What we have found in the past five years is that the NHS and CAMHS waiting lists are far too long for young people seeking support and in many cases the issues have to be at a certain level of harm to be considered suitable for counselling. Unfortunately for many young people before they are able to be seen the problems have escalated so far they are unable to attend education and some have been driven to taking their own lives. 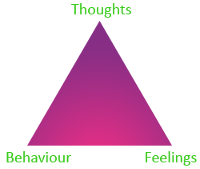 With young people in schools, we apply cognitive behavioural therapy (CBT) methodology foundation and principles that underpin and teach young people the relationship between thoughts, feelings, and behaviour. This awareness and recognition of how negative thoughts can affect feelings, mood and behaviour will empower and enable young people to learn how to replace those unhealthy and unwanted thoughts with more realistic ones. We work closely with schools in order to identify and provide early intervention for young people at risk of developing anti-social behavior, and those who are showing worrying behavior. Sessions take place within the school where possible, to avoid any disruption to the child’s daily routine, and avoid added strain on the families. We are also equipped to see children in our office in North Street, thanks to our specially designed play therapy room. Fully equipped with a wide range of activities, toys and books, it provides children with a safe environment to explore their feelings, and face any emotional traumas that they may have had.